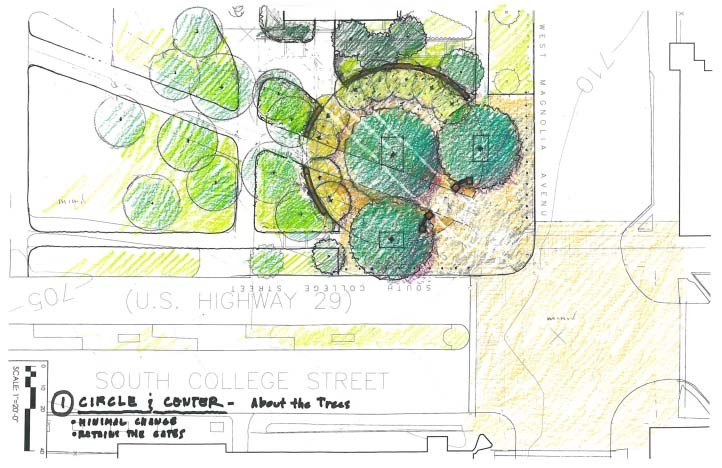 A second round of public workshops held yesterday in AU’s Foy Hall auditorium produced the first visuals of what your children will call Toomer’s Corner. Arches, an elevated intersection, the demolition of Biggin Hall, and maybe converting the entrance to campus into some sort of amphitheater (but, sadly, no “Transformer type technology”) were just a few of the possibilities that made it to the idea presentation stage of the first round of workshops (which you can watch a video of). 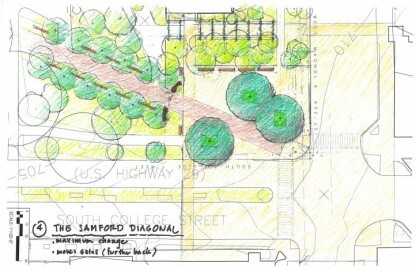 But here’s what the landscape architecture experts are thinking. 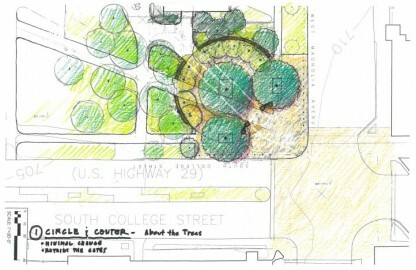 Conceptual drawing of the “Circle and Center” option. 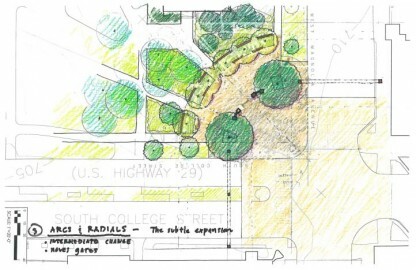 The arcs and radials option is considered a subtle expansion. 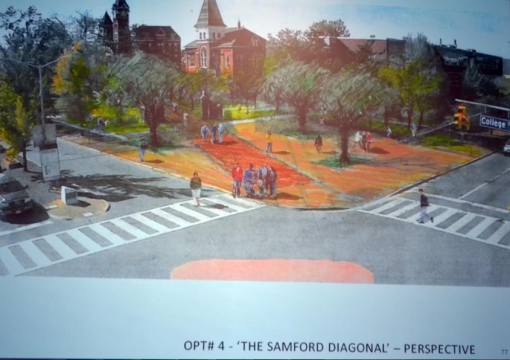 The Samford Diagonal option, presents the most radical change, including moving the historic gates deeper into the campus. 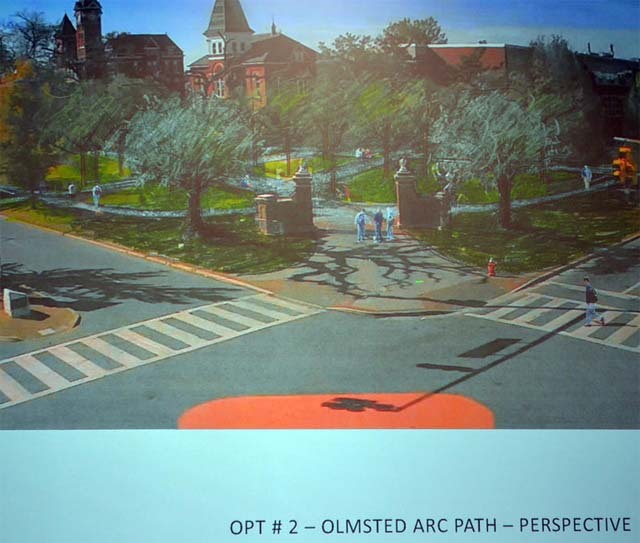 All four options include large trees, a decision that was reached in January. 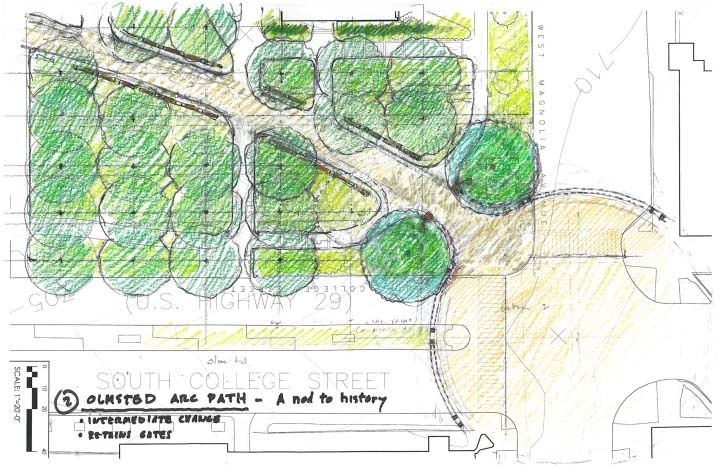 According to AU’s Dan King, a final design will be ready by Spring. 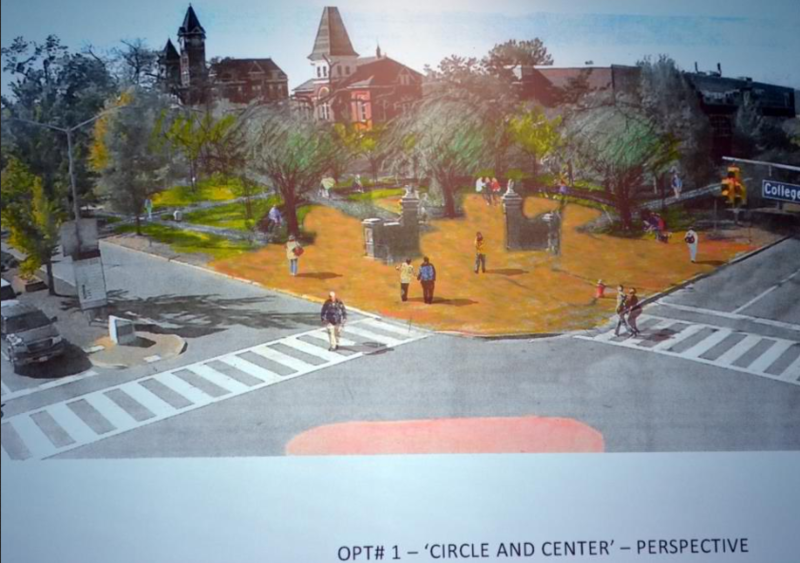 Artist rendering h/t @AuburnVillager. 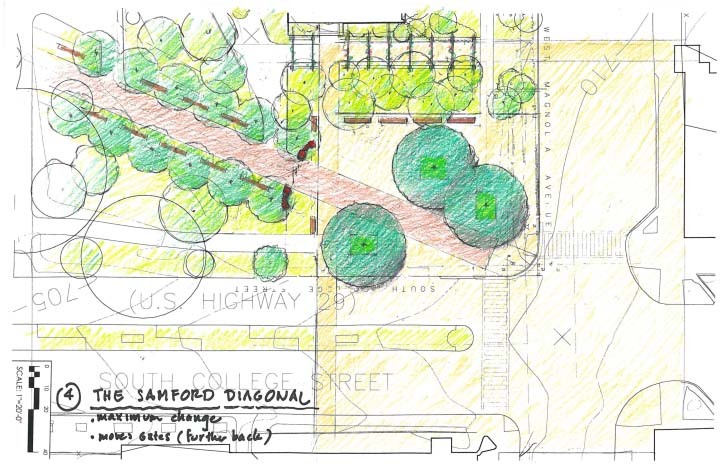 Check out their Facebook page for more drawings and information, and / or pick up a copy of The Villager tomorrow. 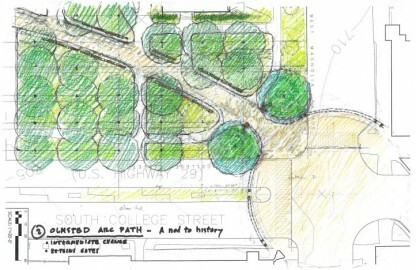 Preliminary drawings provided by the Auburn University Office of Communications and Marketing. Related: A webcam shot of the Toomer’s Corner fire. first design (OPT #2): I don’t think there is enough room for a full size overcup oak. 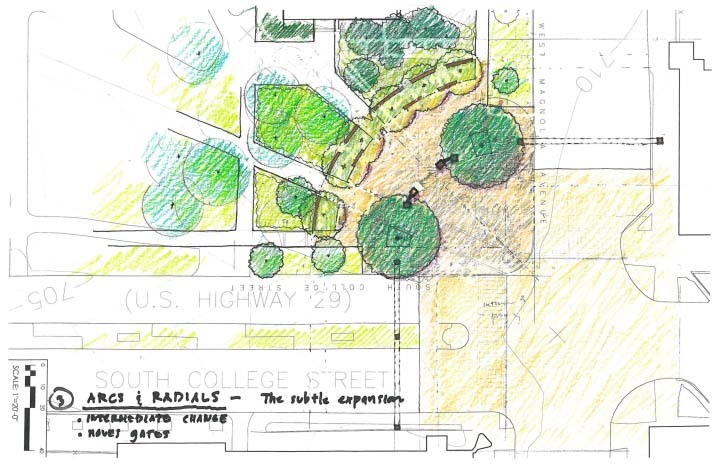 Unless those 2 trees to the side are NOT overcups and the main one is… maybe I should watch the video. Thumbs down on all of them. I think it needs to be back as much like the original. 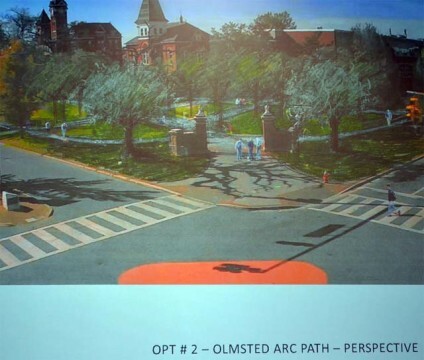 These renderings will take away the tradition, and that’s exactly what we don’t want. You change it and it won’t be the same. It NEEDS to be the same (as much as possible). I’m going with Option 1 “Circle & Center”. I’m still baffled by the idea that they could tear down Biggin. Biggin’s nothing really special, is it? They’re not talking about knocking down Langdon Hall or Hargis Hall, are they? Biggin’s a beautiful building and a great example of International-style architecture. It’s also housing a ton of really rare printmaking equipment and has the only good gallery space on campus. They gutted it about 10 years ago and I can’t imagine they’d tear it down. What about bronze trees? Still could roll them after an auburn win!